Sheila and Keith welcome you to the Somerville Hotel, Blackpool (Llicensed hotel) where you can always be assured of a warm and relaxing atmosphere that will entice you back again and again. Just a few minutes walk from the Pleasure Beach and within walking distance of the Beach, the Golf Course, Casino, Parks, Shopping Outlets, Night Clubs and Ice Skating Ring this warm and comfortable hotel offers excellent accommodation and facilities for families and couples throughout the four seasons. 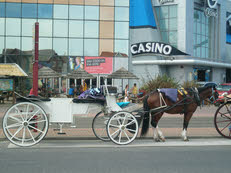 The Somerville Hotel, Blackpool is situated in a quiet street near to Social Clubs where children are accepted. Private car parking is available at the back of the hotel (please arrange on booking) and there may be some parking on the front road there is also a public car park just down the road. Trams bottom of the road. The Airport is just 10 mins away and the Train Station is also within walking distance. is just a few minutes walk from the Promenade and North Pier where the beach front has been completely renovated. 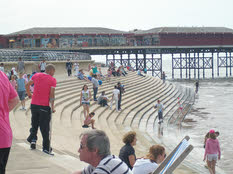 The Casino and well acclaimed Water World are also just across the promenade. The Somerville Hotel prides itself on good hygiene and high standards. It offers a superb home cooking with a full English Breakfast or a choice of Dining Options including Vegetarian. Please let us know on booking if you are vegetarian or have other dietary needs. Evening meal can be booked the evening before or at breakfast.